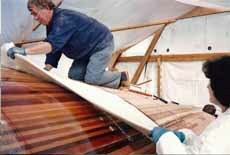 Why did we use the cedar strip boat building technique to build our cruising sailboat Alacazam? 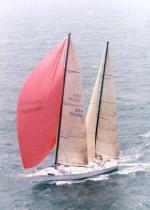 For three main reasons - the superior qualities of cedar as a boat building material, the speed of construction of the cedar strip boat building technique, and the strength and lightness of a wood-epoxy hull. Cedar is a light dimensionally stable wood, with a very high strength-to-weight ratio. 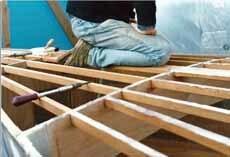 It doesn't absorb water readily and is highly resistant to decay, so the common enemy of most other boat building timbers - rot - is not an issue. 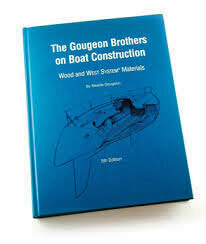 It really is an exceptional wood for boat building. Cedar is a sustainable resource, produced in managed forests, so those of us with a care for the environment can build our boats with a clear conscience. 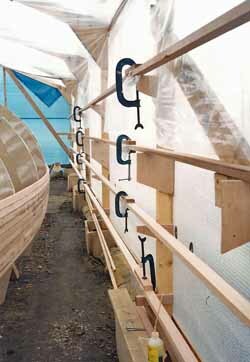 So with the shed complete and the stillage and frames accurately set up, lined and levelled we were ready to get going with cedar strip boat building. 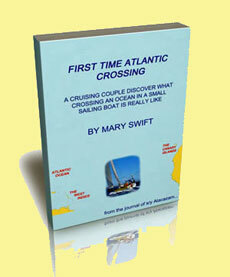 Well almost, but first we had to make the planks. We could have bought them already made, but chose to save a few pounds by making our own from 4" x 2" (100mm x 50mm) rough sawn cedar timbers. 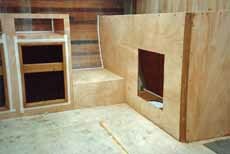 Afterall, we had the resources; Andrew's workshop which boasted amongst other essential stuff a bandsaw and a planer-thicknesser. 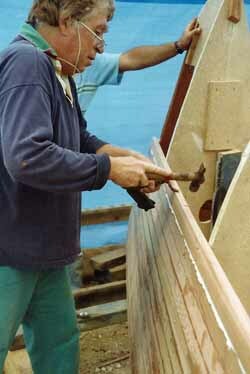 We soon had produced a good supply of 2" x 1" (50mm x 25mm) cedar strips, which we scarfed together into full hull-length planks. On its own, each type is stable but when mixed together in the proportions recommended by the manufacturer they react and start to 'go off', becoming an immensely strong bonding agent, or glue. To this concoction we added a high density structural filler and mixed it thoroughly. 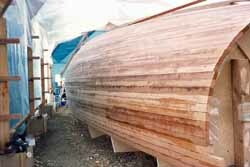 The result was a very sticky 'gloop' which would bond the planks together and fill any voids. Talking of which, avoid getting this stuff on your skin; it's not good - you should always wear disposable rubber gloves when mixing and applying it. 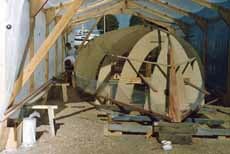 The hull was built upside down, with the first plank - the one at the top of the hull - permanently screwed and epoxy glued to the mahogany stem and temporarily screwed to each frame through to the one at the transom. 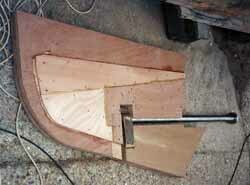 The next and subsequent planks are epoxied to the one preceding it, and secured to the plank below it with a dowel pin. These were cut to length from wooden barbecue skewers, and were driven into holes drilled vertically into the planks between the frames. We must have cut thousands of them. 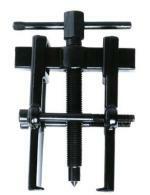 The screws were removed once the epoxy gloop had set, but the dowels were of course left in. 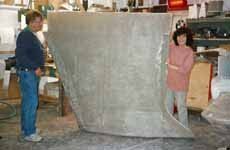 As the planking progressed and the curvature of the hull became more pronounced, so we used 1" x 1" (25mm x 25mm) planks to make bending them into position easier. The edges of the temporary chipboard frames are covered with a strip of polythene to prevent the epoxy doing what epoxy does best. Now with the planking complete and the screw holes plugged with epoxy, we ready for the next stage of cedar strip boat building; fairing the hull and sheathing it with epoxy and woven glass rovings.